“Relax this weekend,” my mom said as we loaded our camping gear into Donna’s trunk [that’s what we’ve chosen to christen our car]. “No work. No email.” “Do moms ever stop worrying?” I wondered. As I rode passenger and Clark drove down the familiar two-lane state road that leads out of town, I wondered, “Maybe the better question is will I ever start listening?” I turned off the ringer on my iPhone and moved it from my lap to the storage compartment in my door. Outside of the car looked better anyway. Cottonwood – the stuff that irritates eyes and noses this time of year – was everywhere. The big puffs hung suspended on the warm breeze, blowing in through our vents, and hunkered down between the rows of barely-sprouted crops. Jack Johnson was the driver’s choice of tunes and he hummed along to every mellow song. I let my hair blow however it wanted and enjoyed the sunshine as it baked my right arm. Memorial Day weekend had begun. We didn’t get very far before realizing that we made an amateur mistake – forgetting the coffee cups. So we stopped at a gas station before getting onto the interstate. I looked to my left when we parked the car, only to see the big blue sign of a “Relax Inn” reminding me of what my mom said earlier. Life’s funny, innit? I relaxed like I hadn’t relaxed in a long time. Probably since our honeymoon. And it. was. awesome. Although I still had access to my phone and I wasn’t too far out into the wild, it still felt like a special getaway. For a little while, I got to forget about everything outside of a couple square mile of woods. I found that it was so much easier to talk, connect, laugh, and feel simple. I wanted to fish, and play frisbee, and I slept like a baby – all things I wouldn’t feel like doing on a regular day. Maybe it’s getting away from normal amenities or feeling uncomfortable or just having new experiences. Whatever it is, it’s good for me and I like it. Full disclosure: the first thing we did when we got home was make a mad dash for the shower. No shame. 2+ days of sweat, bug spray, smoke, and more sweat equals sticky, smelly Jordan and Clark. Aren’t we humans so spoiled these days? Nevertheless, it was a good practice run for our upcoming road trip – we’re definitely going to be hitting up rest stop showers whenever possible along the way. This delicious bowl of pasta was our first post-camping meal and like that shower I mentioned, it so hit the spot. Ever since I realized that rice noodles were the best thing EVER, we’ve been making this dish ALL. THE. TIME. 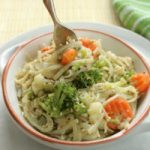 I love to use rice noodles because they have a more delicate taste than wheat or gluten-free varieties – which is all the better for letting a good sauce shine. Another plus? Rice noodles allow you to slam larger amounts of pasta, which is a win in my book. As for the sauce, prepare to be surprised. It’s not like alfredo. It’s not quite like a white wine sauce. It’s tangy, creamy, a little sweet, and perfectly light. 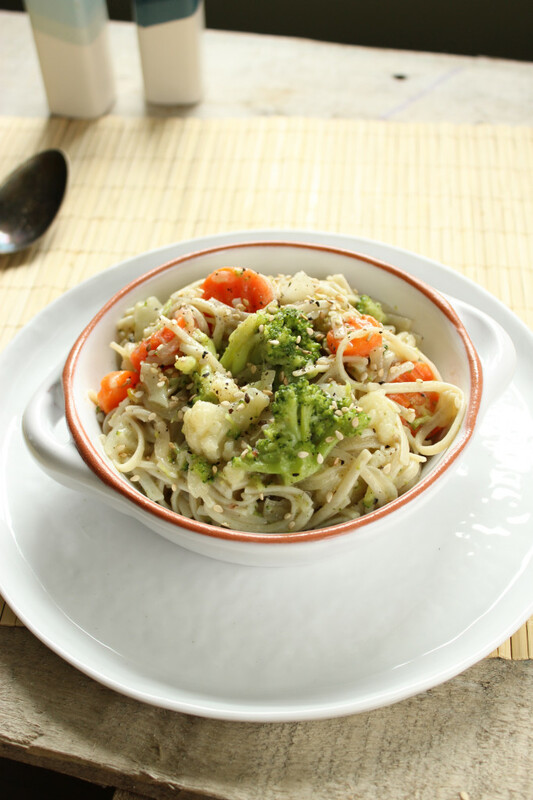 It tastes like a rich, satisfying pasta dish, but lacks the calories and heaviness that butter and cream-based sauces usually bring. 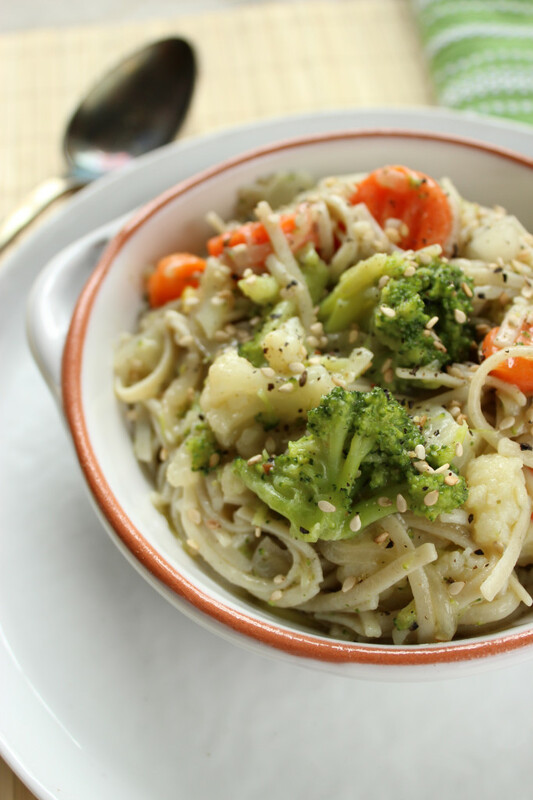 We usually use a mixture of frozen vegetables for this dish because we don’t always have the right fresh ingredients on hand. In a pinch, you can easily substitute with peas, brussels sprouts, greens, bok choy, etc. 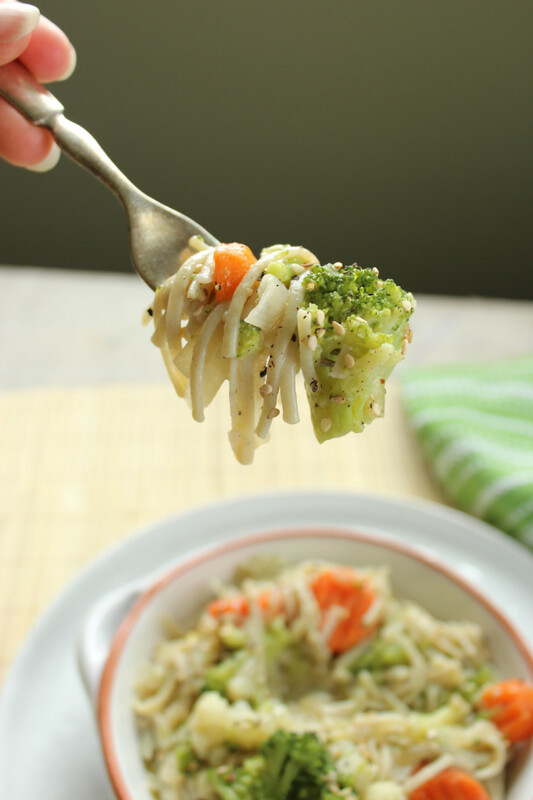 – which makes this a perfect go-to pasta as vegetables go in and out of season. 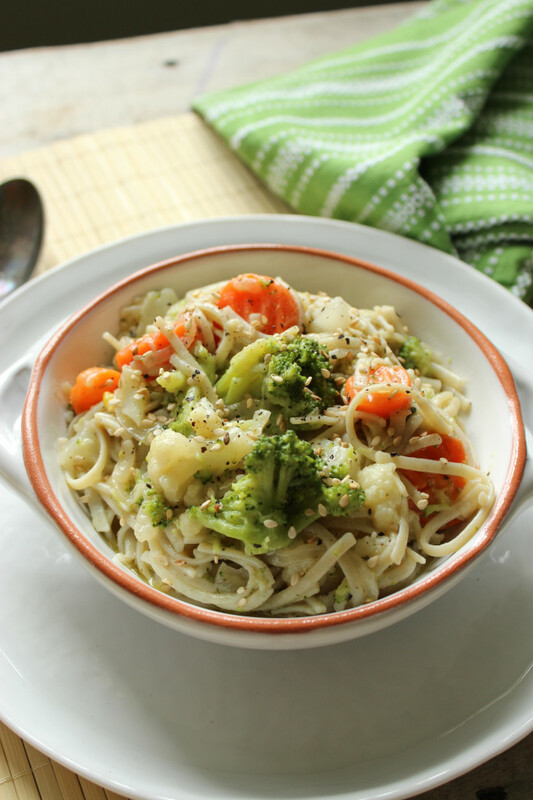 A quick pasta dish made with a light, creamy vegan sauce and tossed with healthy vegetables. In a medium pot, warm about 1/2 cup of water on medium. Once warm, add veggies, a pinch of sea salt and a dash of pepper. Cover and cook for 10-15 minutes, until tender, stirring occasionally. They should finish around the same time as the pasta and sauce. Now for the sauce! In a frying pan, heat olive oil on medium. Once heated, add onions and sauté until they begin to soften. Add garlic and continue to sauté for another minute, stirring continuously. Decrease the heat to low-medium and add vinegar, ginger, and salt. Stir for 2-3 minutes. Shake the coconut milk to combine well, then add 3/4 of the can. Increase the heat to medium-high and continue stirring for 3-4 minutes, then lower the heat to a simmer. Keep stirring occasionally to prevent it from scorching. This is a good time to cook your pasta. Bring water to a boil and add pasta. Cook for 6-8 minutes, depending on what type of pasta you use. Drain the pasta and veggies, then combine them in the largest pot [a separate glass bowl would also work] and pour the sauce over top. Use a big spoon to mix everything together and cover with the sauce. 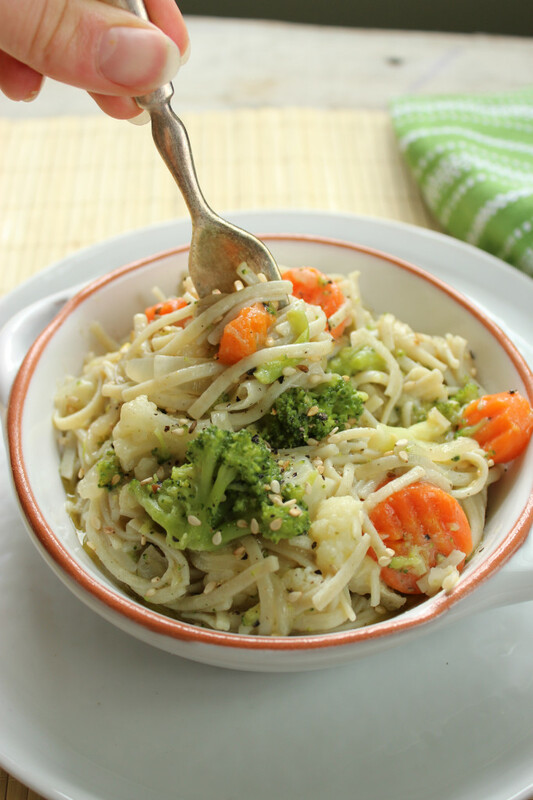 Made this yesterday, do you mind linking to your recommendation for the rice noodles you use? I bought the angel hair rice noodles at my local store, and while the dish was tasty by the time I mixed everything together the noodles had the consistency of porridge or oatmeal. Very delicious though, I just want to know what kind of noodle you use. Sure! These [below] are my absolute favorite — and they’re super cheap on Amazon. Hopefully these will work better for you! Sorry about that and thanks for letting me know – I’ll get the link fixed! We use King Soba brand’s Thai rice noodles and highly recommend them. Amazon used to sell them and many health food stores carry them.